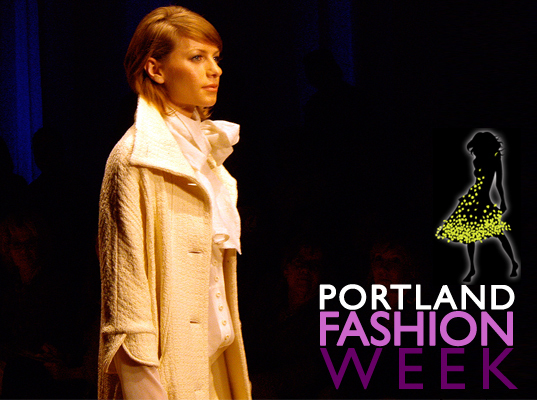 Dubbed by its organizers as the world’s only “comprehensively eco-sustainable” fashion week, Portland Fashion Week 2009 stands out among the slew of runway events for its use of LED lighting, all-natural beauty products, organic food and wine, and the pièce de résistance, a bamboo runway—a fitting catwalk for models donning green apparel from the Spring/Summer 2010 collections of A Fortes Design, Mountains of the Moon, Jonano, and Ethos Paris. 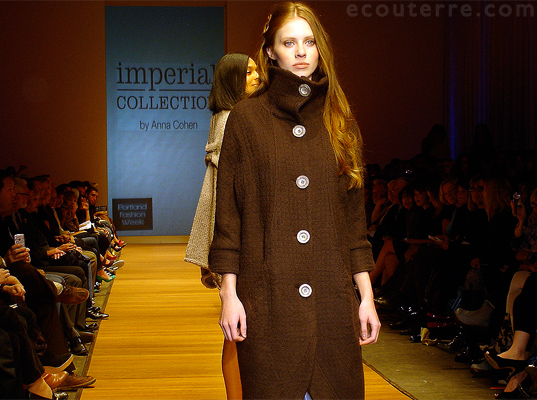 (We were also treated to a Fall 2010 preview of the Imperial Collection by Anna Cohen.) Ecouterre was poised at the end of the runway, in the country’s most sustainable city, to capture the eco-fashion highlights. Portland’s own A Fortes Design kicked off the show with a collection of casual wear that could also translate to the workplace. Subdued gray palettes, with a few surprising bursts of tangerine, were plentiful throughout the collection, which is produced with handmade hemp and organic cotton textiles by twentysomething designer Janessa Bautista. Mountains of the Moon was up next with a playful offering of flirty, colorful dresses, pants, and tops that hip, green twenty and thirtysomethings will find irresistible. Many of the pieces were reminiscent of the classic apparel worn by fashion icon Audrey Hepburn. Hemp, organic cotton, and Tencel are the eco-fabrics behind this collection designed by Chicagoan Melissa Baswell. Despite its recent run-in with the Federal Trade Commission over marketing its use of bamboo as eco-friendly, Jonano was on hand to present a collection filled with youthful, urban eco-separates in a tonal color scheme. 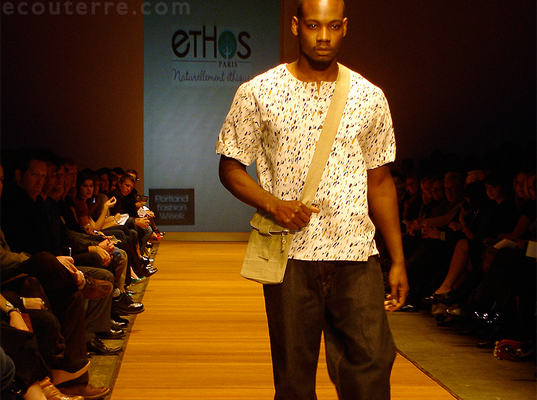 The line included many new eco-textiles, such as peace silk, “energy satin,” and bamboo line, along with a new watercolor-dye technique use in Jonano’s ecoKashmere pieces. Ethos Paris offered a wide range of casual separates for men and a vibrant selection of dresses for women. (Flowers tucked behind each model’s ear evoked a breezy, island-vacation vibe.) Organic materials and fair-trade practices are at the core of Ethos Paris. The Imperial Collection by Oregonian Anna Cohen stole the show with designs she created using locally sourced, sustainable wool from the Imperial Stock Ranch in central Oregon. Gorgeous earth-toned knits and woven coats, vibrant red pants, and a quintessential little red dress were standouts in a collection that most eco-fashionistas—including us—would consider flawless. Dubbed by its organizers as the world's only "comprehensively eco-sustainable" fashion week, Portland Fashion Week 2009 stands out among the slew of runway events for its use of LED lighting, all-natural beauty products, organic food and wine, and the pi�ce de r�sistance, a bamboo runway�a fitting catwalk for models donning green apparel from the Spring/Summer 2010 collections of A Fortes Design, Mountains of the Moon, Jonano, and Ethos Paris. (We were also treated to a Fall 2010 preview of the Imperial Collection by Anna Cohen.) Ecouterre was poised at the end of the runway, in the country's most sustainable city, to capture the eco-fashion highlights.